Just like every other highly anticipated moment in our lives, the day of stuffing our faces with turkey and pumpkin pie has come and gone too quickly. The giant bird taking up real estate in the fridge has been reduced to a tupperware of shredded turkey chunks and the once dreamy-creamy mashed potato have solidified into a bowl-shaped white brick in the fridge. OR If you didn’t host Thanksgiving at your place, you look into your empty fridge longingly, wishing there were leftovers and dreaming up another Thanksgiving meal to make just so you can have some leftover stuffing and pie. Well, that’s how I feel anyway. I celebrated a delightful Thanksgiving with my family – Sam, Mom, Boo-nater and Boo-natrix, my aunt Beyonce and her Jay-Z (don’t ask). 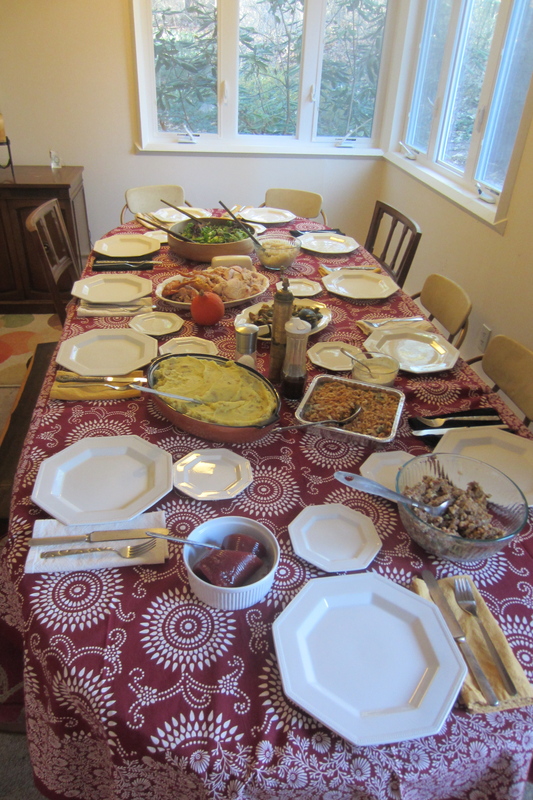 Our hosts cooked up a mean feast of turkey, sausage stuffing, brussel sprouts and bacon, cranberry sauce, mashed potatoes, green salad, and mashed turnips (special request). 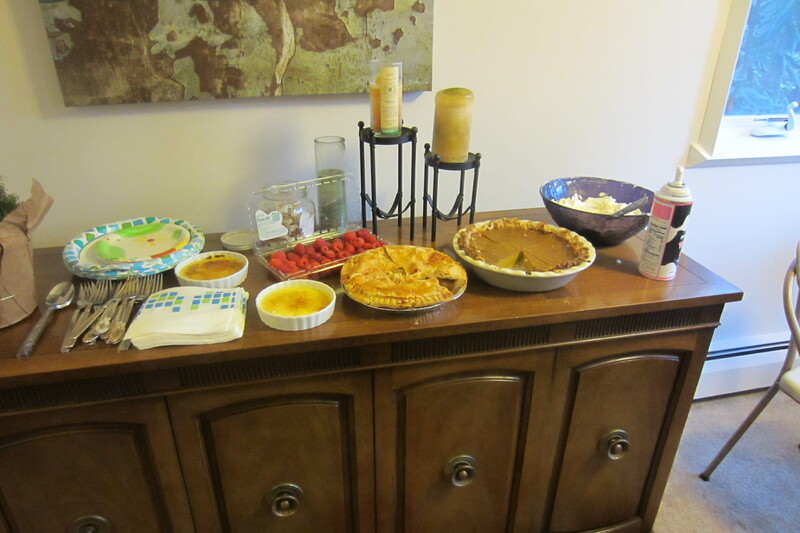 My aunt and I helped with the dessert spread, making an Alice Waters’ recipe pumpkin pie, vanilla creme brulee (another special request), and apple cider caramels. 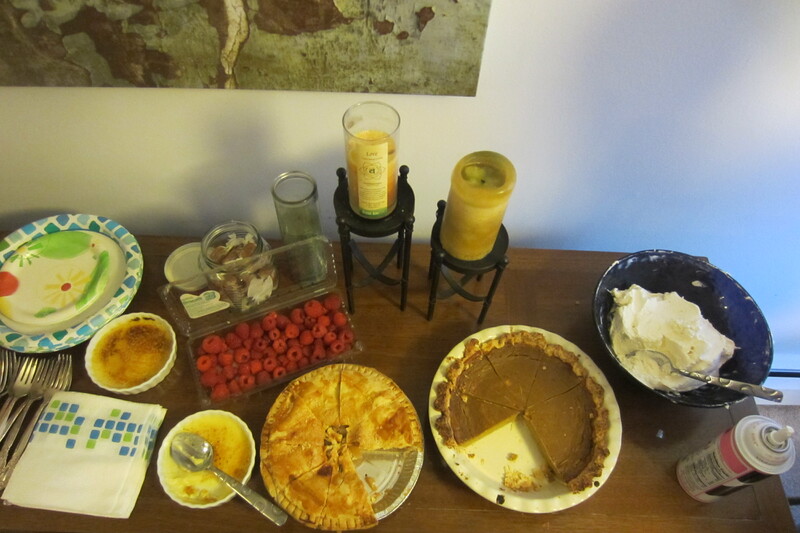 We also had an apple pie and pear and cranberry crisp brought by another guest. 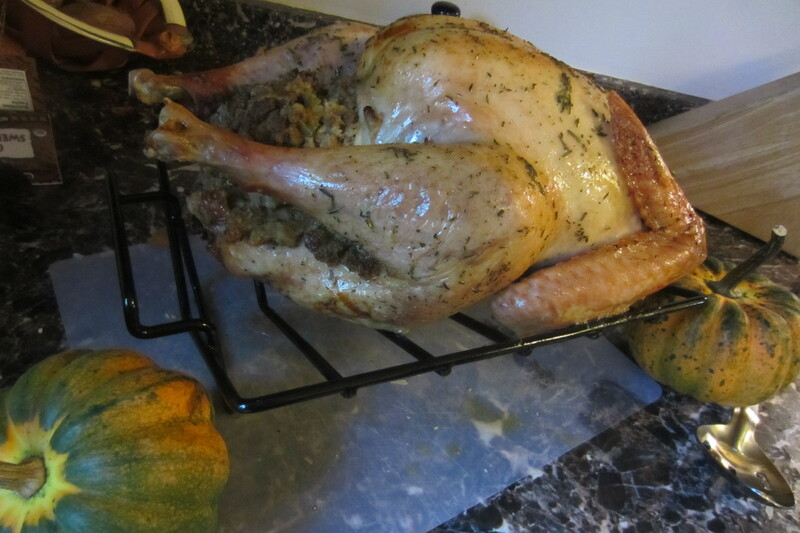 Here is my Thanksgiving in pictures. There are never enough pumpkin recipes, in my opinion. Here is another delicious one. 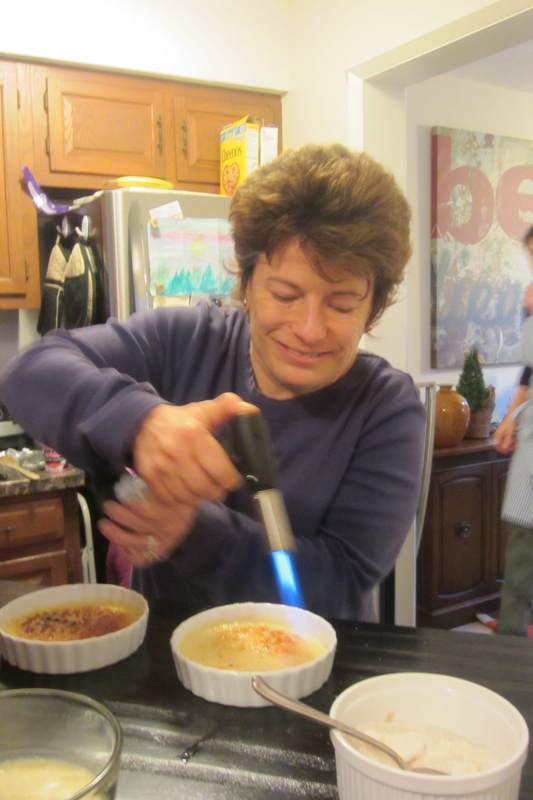 Remember when we made lavender crème brulée and it was much easier than you thought? Pumpkin crème brulée is no different. A little canned pumpkin (or roast the pumpkin if you like), some warm and exotic spices and bam! you have a mini pumpkin pie in a dish with a crunchy sugary crust. How could you say no? Here’s how it’s done. So you start with your egg yolks and sugar and vanilla (not pictured). You heat up your cream. Just enough for some small bubbles to show up on the edge of the pan. For the pumpkin part mix pumpkin, a little sugar, and spices. 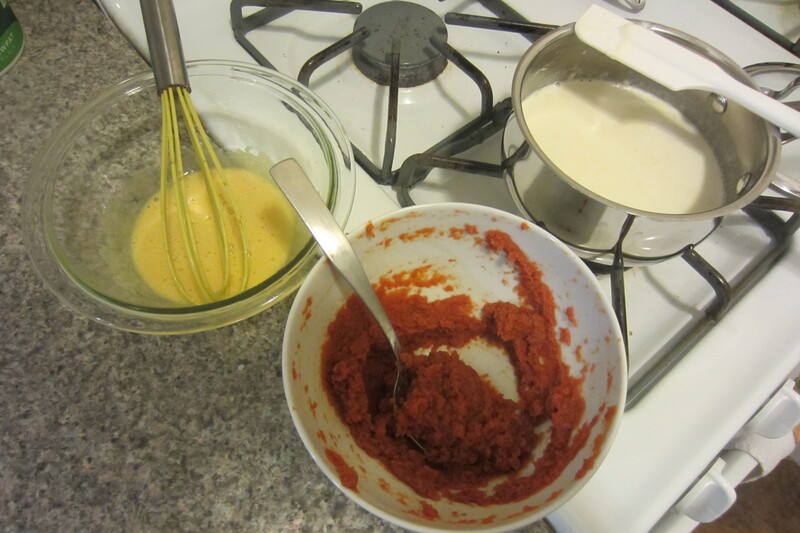 Voila – the primary colors and building blocks of Pumpkin Crème Brulée. 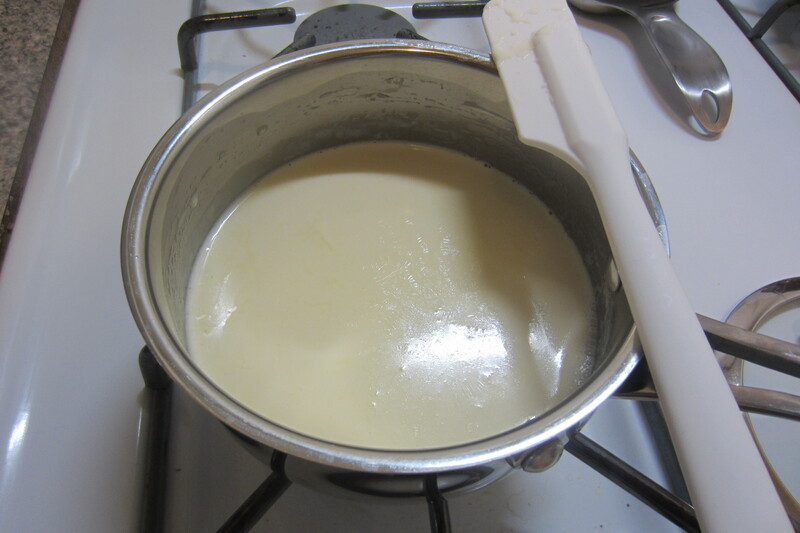 Temper your eggs by very gradually adding the cream. Strain it (in case you scrambled any of your eggs) and you are good to go. For my particular technique I layered my pumpkin and cream mixture separately, though I’m sure you could try carefully folding the pumpkin into the cream and egg mixture. I assembled my ramekins and poured the cream on top of the pumpkin. 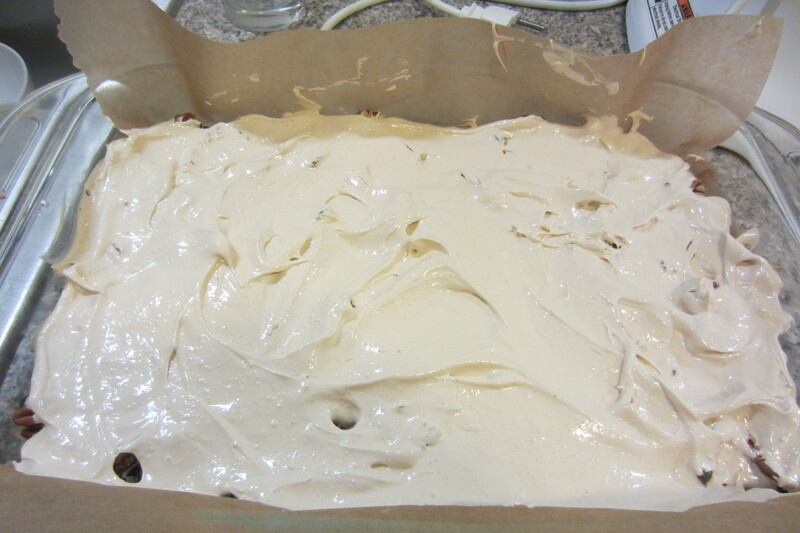 Bake in a water bath until slightly jiggly and let cool. 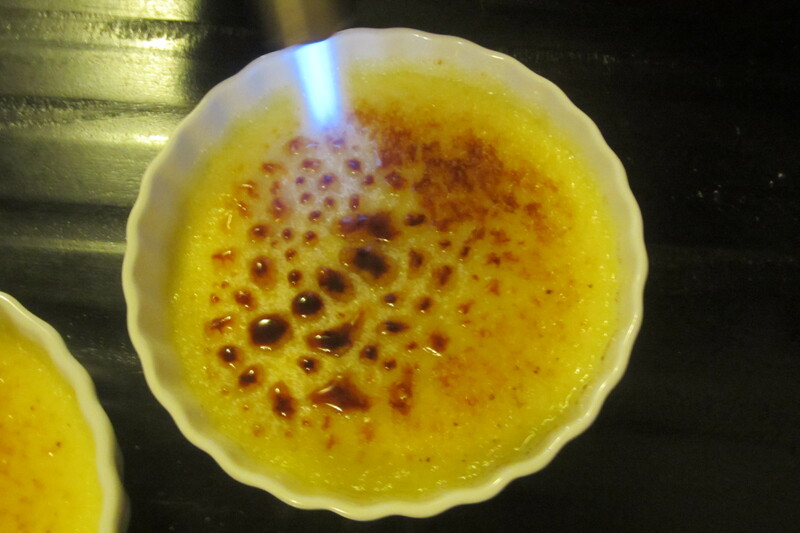 Torch and plunge your spoon into the crackly shield of sugar. 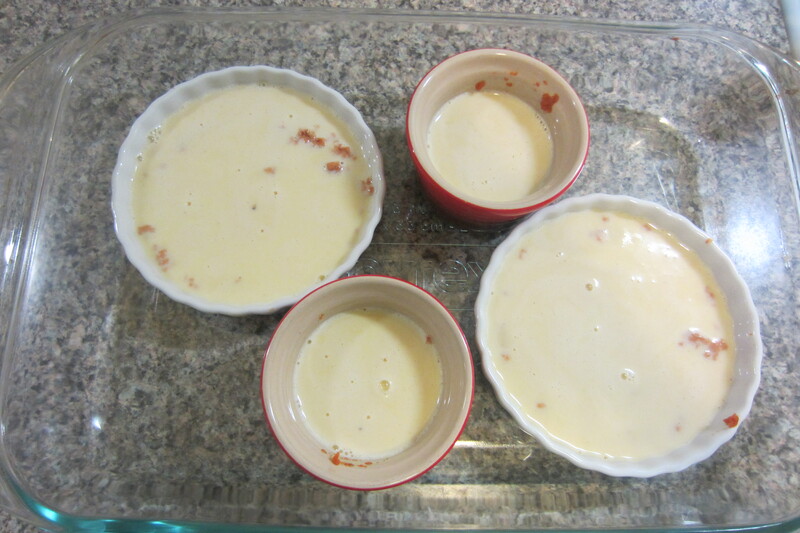 makes 3-4 servings depending on your ramekin size. You can easily double the recipe. Prepare a small pot of boiling water. Preheat the oven to 300 degrees. Heat cream in a small pan over low just until small bubbles start to appear around the pan edges. Do not boil! Remove from heat. 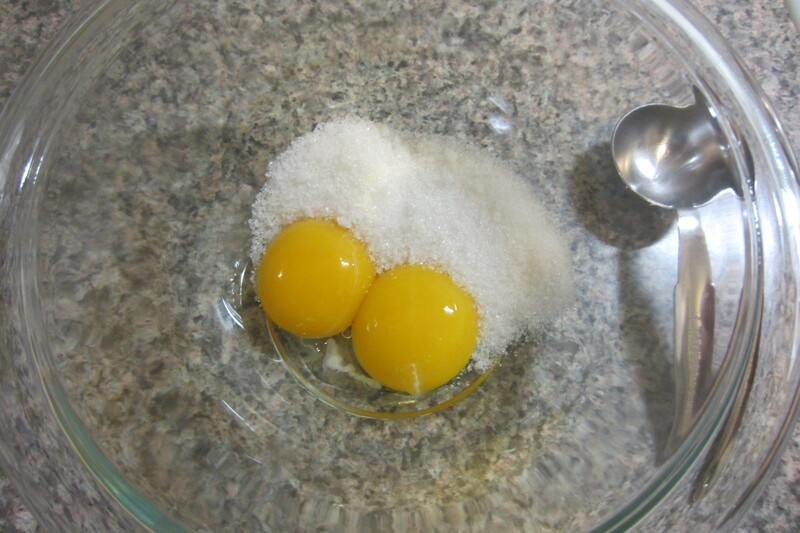 Meanwhile in a small bowl beat egg yolks, 2 Tablespoons of sugar, and vanilla. 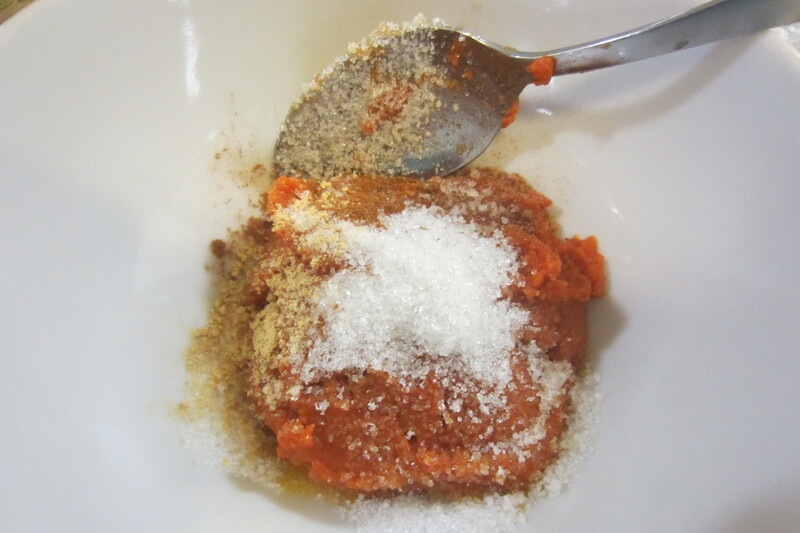 In another small bowl mix pumpkin, spices, and remaining 2 Tablespoons of sugar. 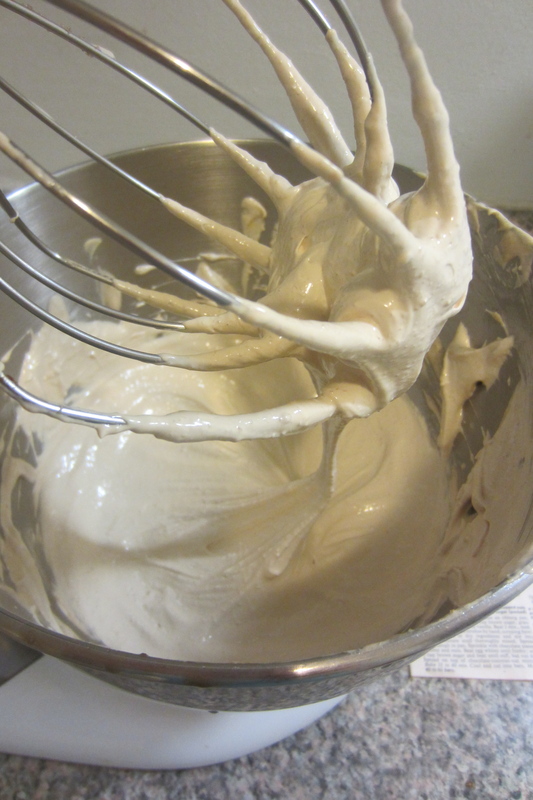 While whisking, gradually add the cream to the egg mixture. 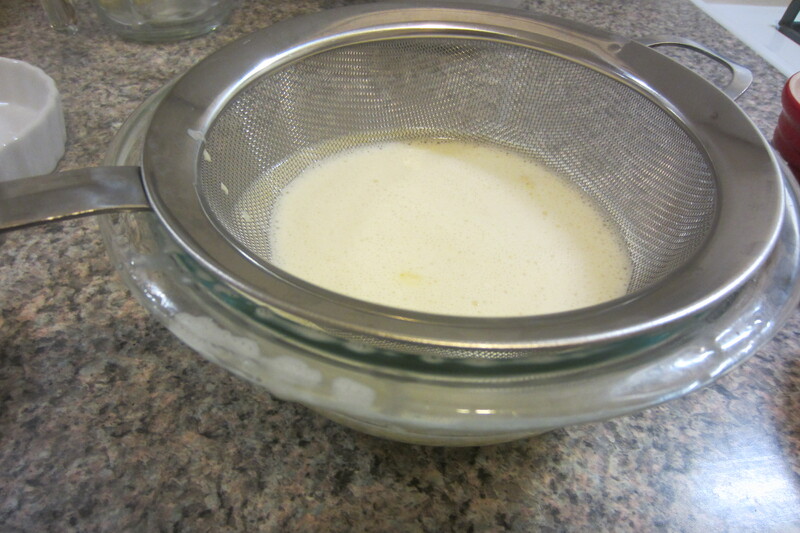 Use a fine mesh strainer to strain the mixture. Lay out your ramekins in a big oven safe pan (use multiple pans if necessary) and divide the pumpkin mixture between them. 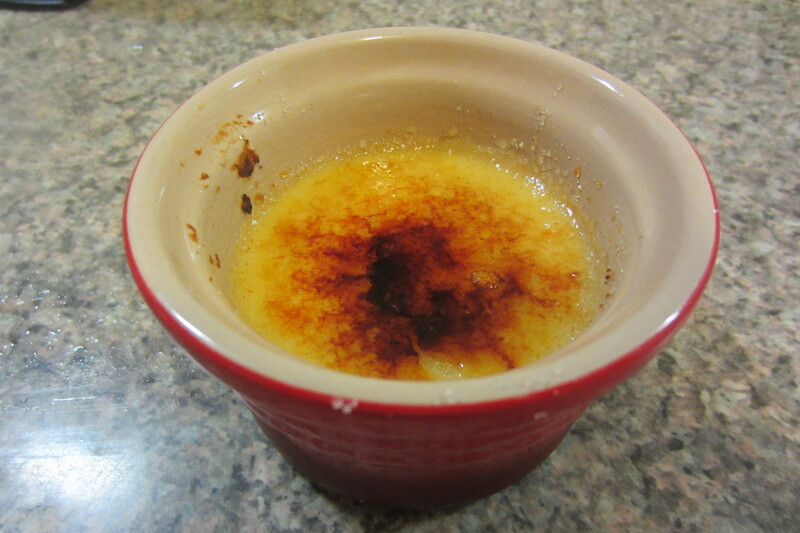 Spread out evenly and wipe off any that you get on the ramekin edges as it will burn. You can put as much or as little pumpkin in as you like but I think it’s best to keep the layer no deeper than 1/4 inch. 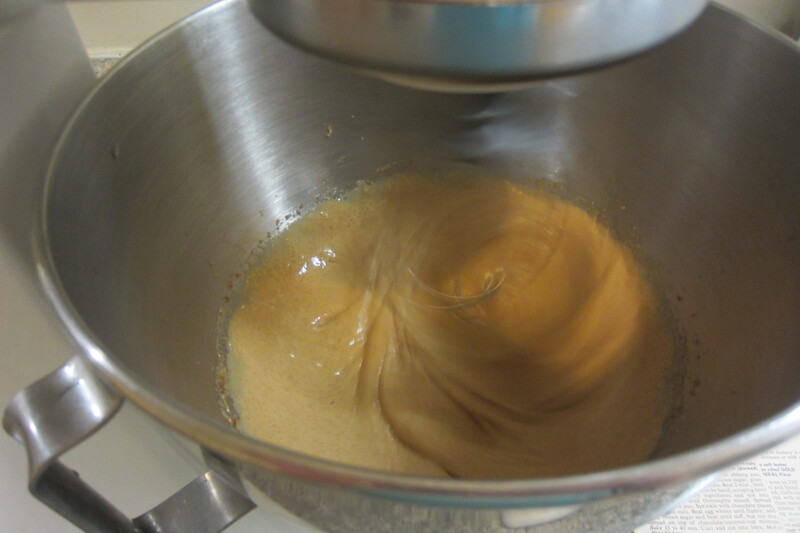 Carefully divide your cream mixture between the ramekins, pouring on top of the pumpkin mixture. Carefully pour your boiling water around your ramekins, being careful not to get any water in any of them. Cover the pan with foil and slowly and carefully transfer your pans to the oven. 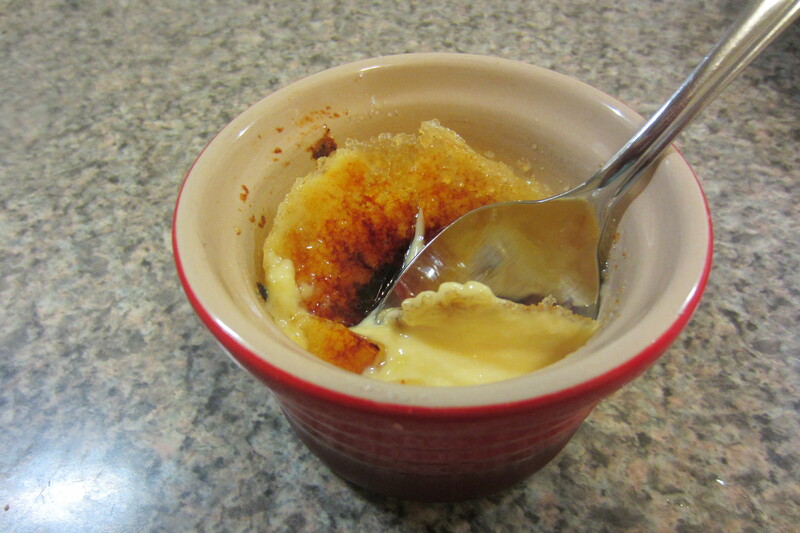 Bake for 20-30 minutes, depending on the depth of your ramekins. You want the custard to jiggle only slightly in the center. Remove carefully, remove the foil and cool. 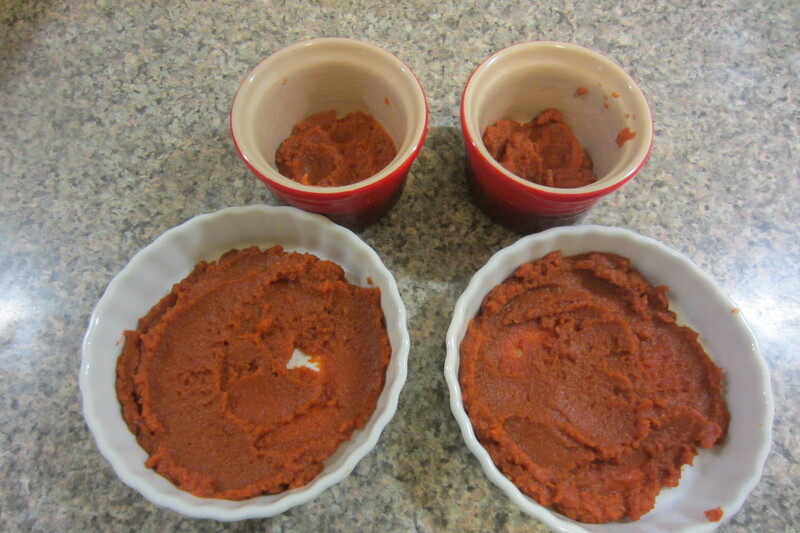 As soon as possible, remove the ramekins from the water bath and let cool on a cooling rack or counter. 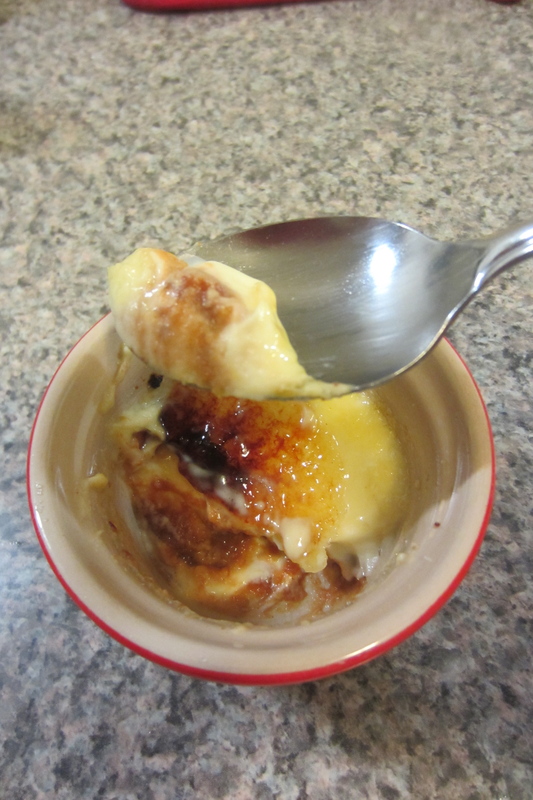 Refrigerate until ready to serve (at least a few hours for chilled custard). 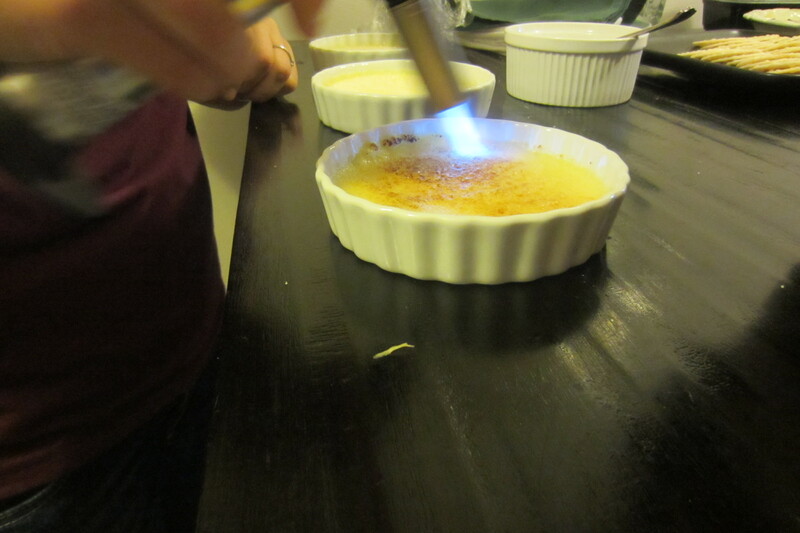 Top with a thin layer of sugar and torch according to your torch directions. Let cool slightly to allow the sugar to harden and serve. And since Spoon Fork Bacon and I seem to be on the same wavelength (believe me I had the idea to make this before seeing their post), here‘s an even more impressive version. I have still been cooking for the family and hoping these children will eat! 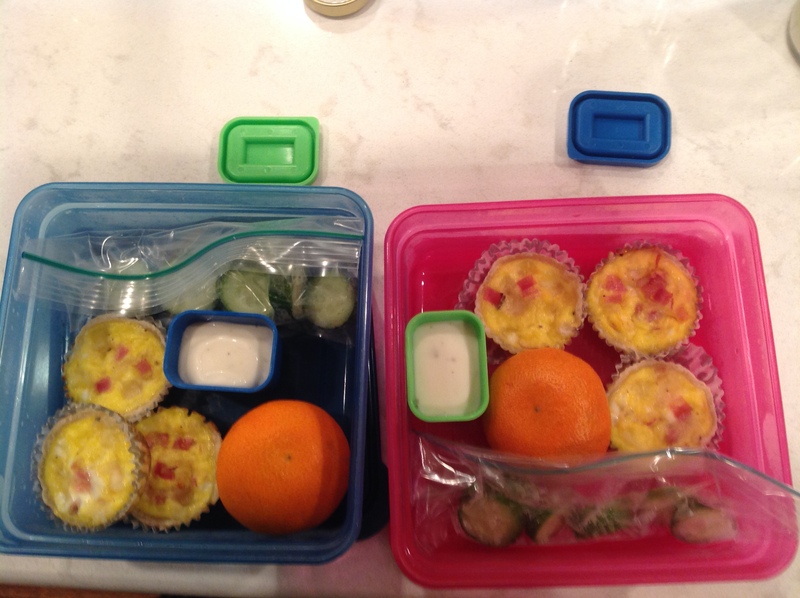 To start the week: Ham and cheese mini quiches, cucumbers, and Ranch to dip! Don’t worry I didn’t give them that much burrito. I just wanted you to see what the inside looked like. 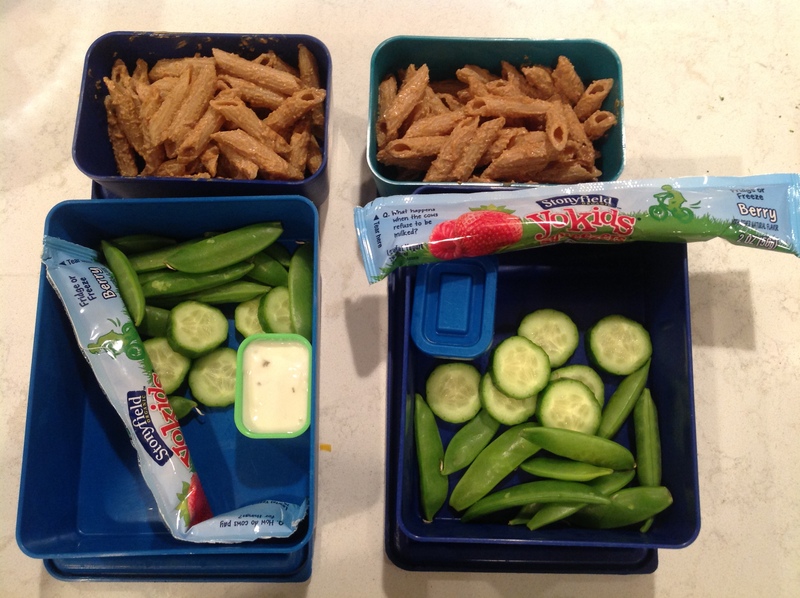 Sunbutter (think peanut butter made with sunflower seeds) pasta with veggies and Ranch and yogurt. Similar to a peanut butter sauce (except no nuts at their school) this sauce is an easy blend of soy sauce, rice vinegar, sesame, and your choice of nut butter. Delicious! Pesto macaroni noodles with broccoli and cherry tomatoes. On the side seared apple chicken sausage (which they love!) and Go-Go Squeez applesauce. 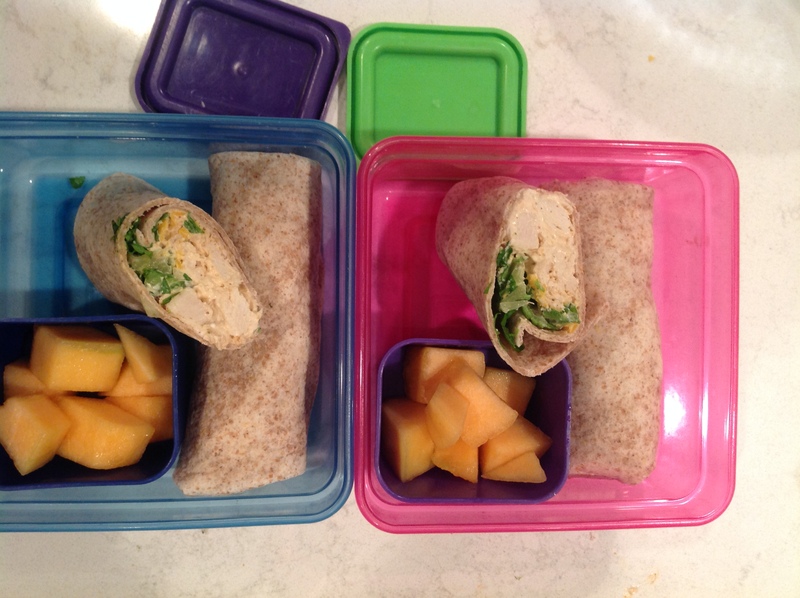 While I am not sure how much of these lunches these kids actually ate, I think they are getting better at finishing what’s on their plates. 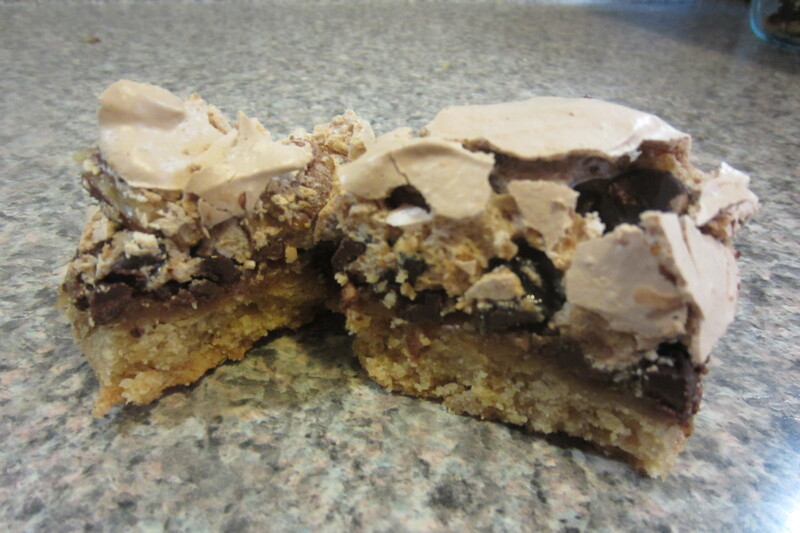 Nonetheless I love to bake and try new recipes so try as I might, I can’t completely avoid sugar. The trick is to make something, try a small amount, and then give away the rest. That way I don’t have a whole pan of cookies or cake to tempt me. It’s true. 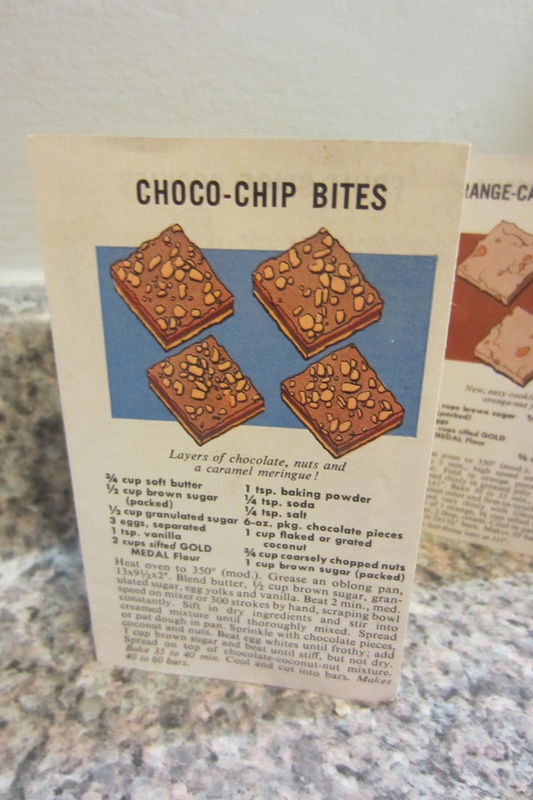 I had picked out this recipe several weeks back after scanning my great-great-grandma’s recipe box and had been meaning to make it. 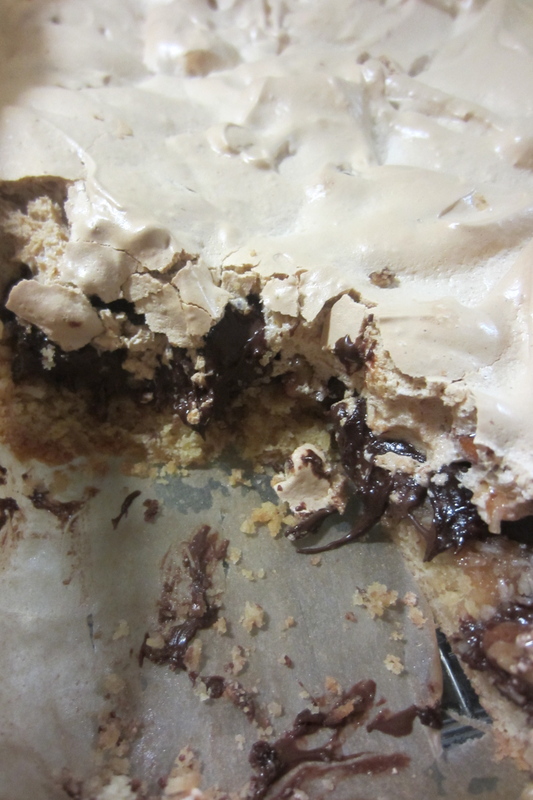 I mean caramel meringue? It sounds intriguing, right? So I finally gave in to my desires and made it, with intentions of giving it to Sam to take to work. The recipe contains nuts and since my workplace is nut-free I couldn’t take it there. I also didn’t need the bars tempting me at work. They were warm, chocolate-y and crunchy coming right out of the oven and so I scooped a small helping into a bowl and ate it with a spoon. Psha! Too many ingredients! Leave it to Sam to like his baked goods simple and classic. 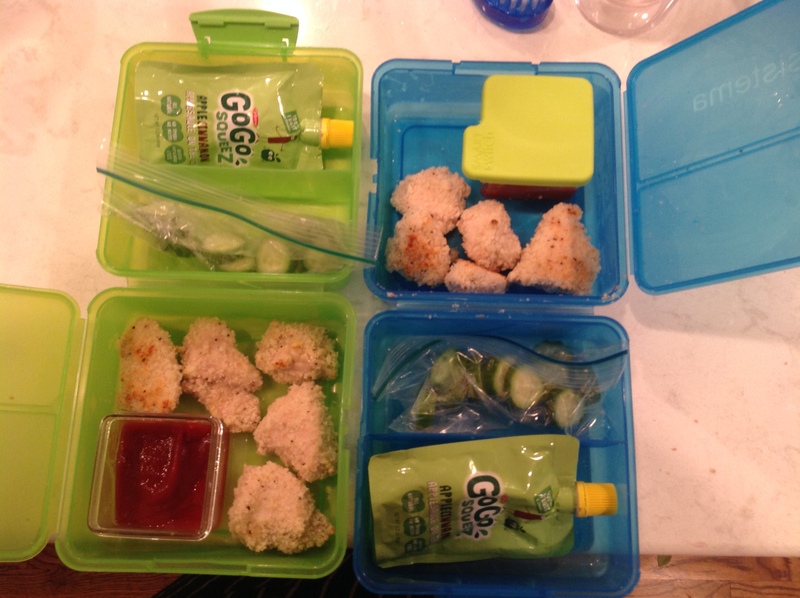 I blame his dad (who may very well be reading this…) Sam seemed hesitant to take them to work because they seemed messy and didn’t meet his taste expectations, but I was determined for him to take them, lest I eat the whole pan. So the next morning, after they had cooled, I cut them into bars (eating the crumbs that fell off as I did) and packed them into containers for him. Now he couldn’t refuse. That’s right! Way to doubt, Sam. Grandmas always know best. Heat oven to 350 degrees (moderate as listed in my recipe). 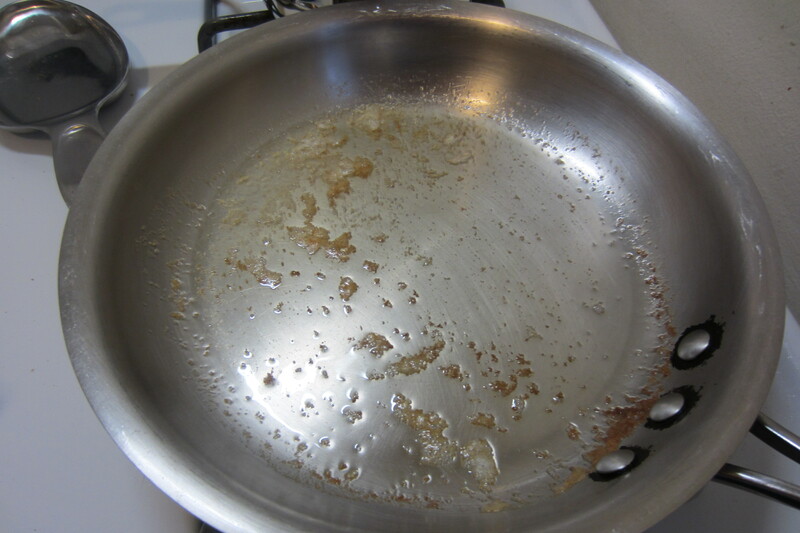 Grease an oblong pan – 13 x 9 ½. Blend butter, ½ cup brown sugar, granulated sugar, egg yolks, and vanilla. Beat 2 min, medium speed on mixer or 300 strokes by hand (! ), scraping bowl constantly. 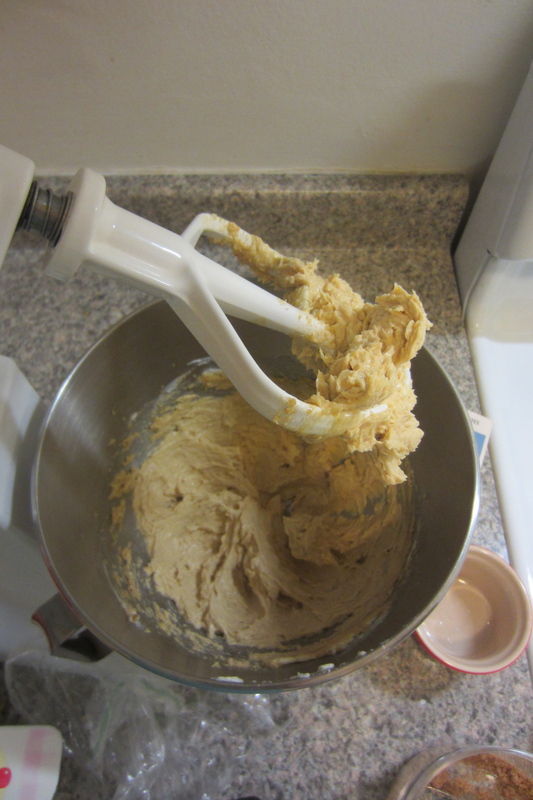 Sift in dry ingredients and stir into creamed mixture until thoroughly mixed. 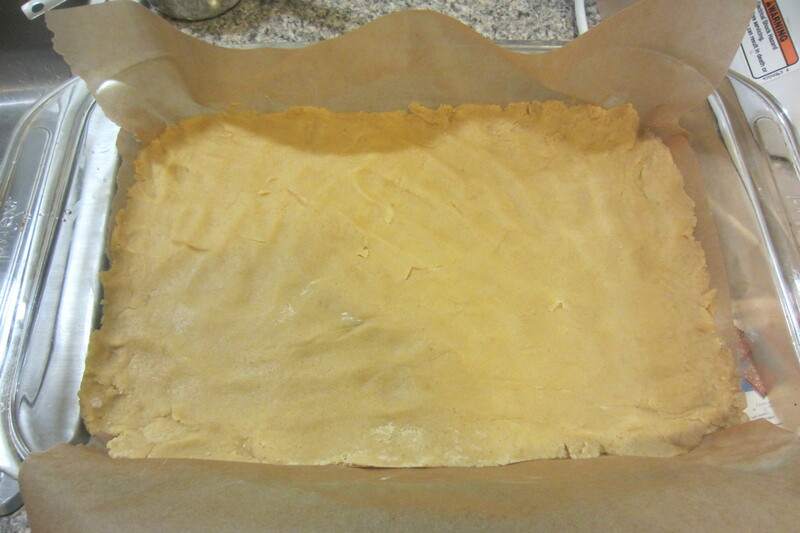 Spread or pat dough in pan (I lined my pan with parchment paper for easy removal). 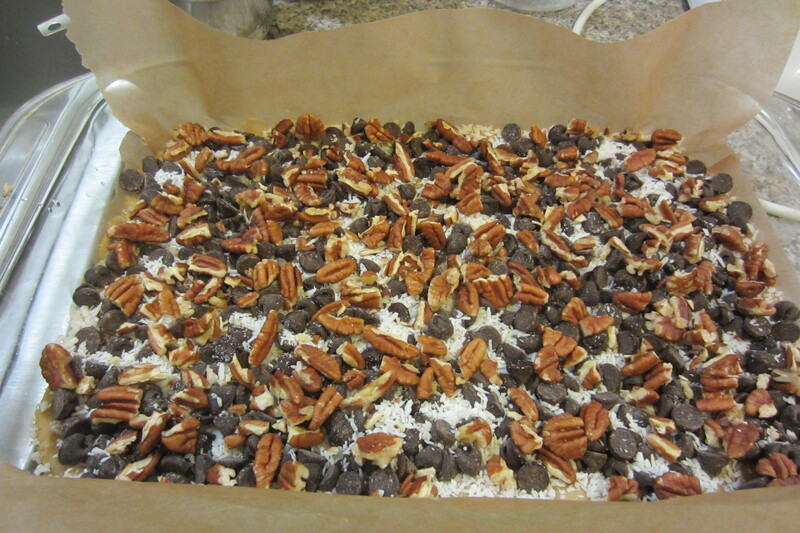 Sprinkle with chocolate pieces, coconut, and nuts. 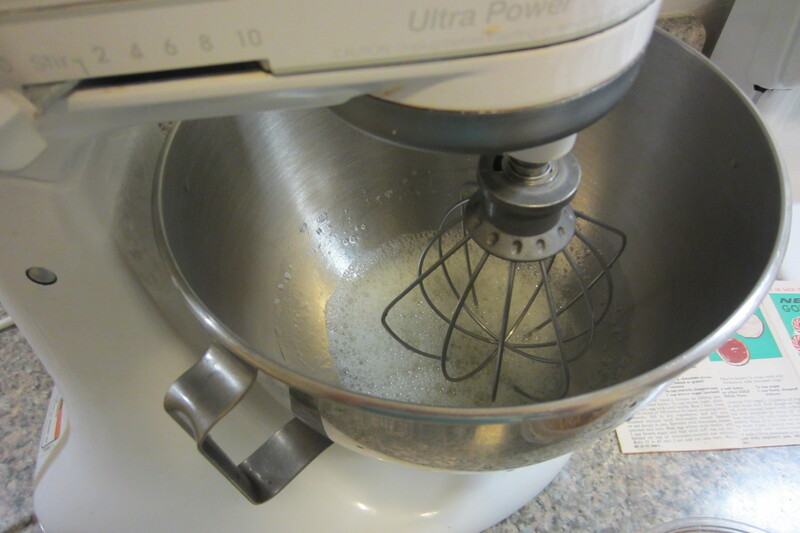 Beat egg whites until frothy; add 1 cup brown sugar and beat until stiff, but not dry. (I found I had to beat it a lot longer than expected so don’t give up hope! See pictures below. I also added ½ tsp. vanilla for flavor) Spread on top of chocolate-coconut-nut mixture. Bake 35-40 min (I found it only took 30 minutes). Cool and cut into bars. 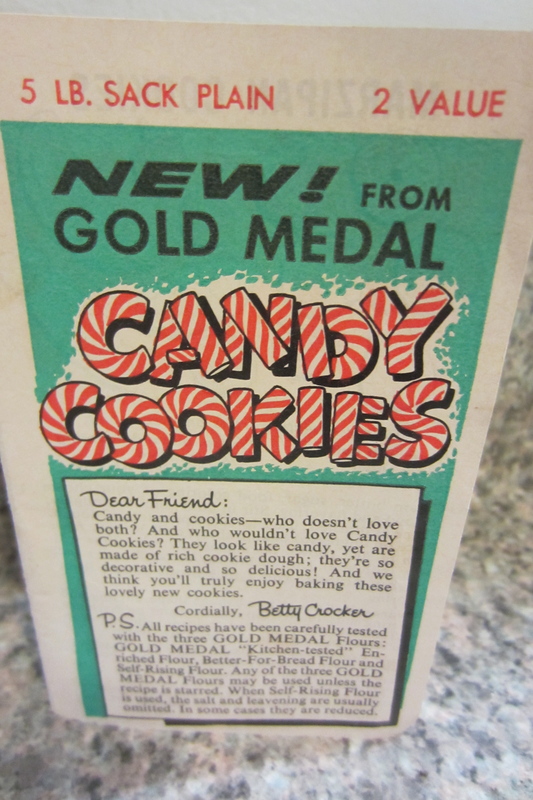 *Eggs separate best when cold, but incorporate into the cookies best at room temperature. 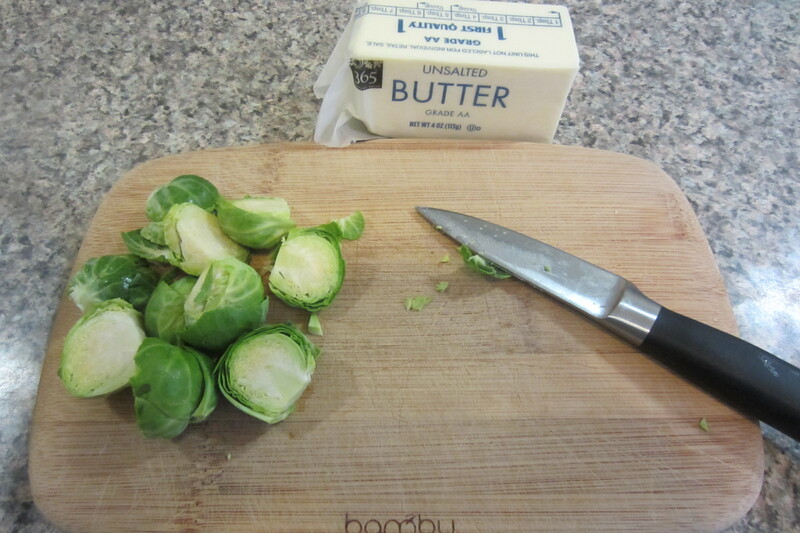 Separate the eggs when you remove them from the fridge and leave out to “warm up” with the butter. Quick quiz – Mise en place – what does it mean? 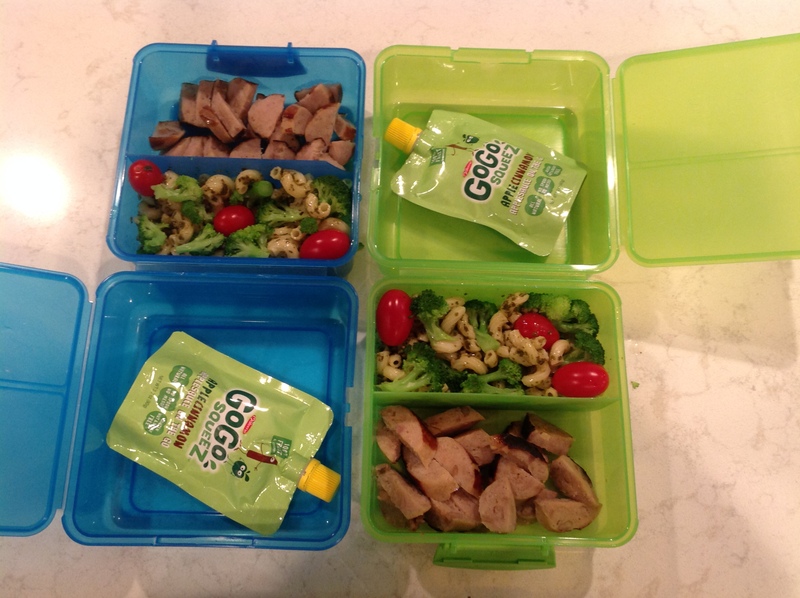 Literally, mise en place is French for “put into place.” That means get yo’self together! When you’re making a recipe, mise en place means getting your ingredients together and doing whatever chopping and measuring you need ahead of time, before the flame is roarin’. Mise en place is the key to cooking success especially if a recipe is complicated. Even if it’s not, getting organized will make things go much smoother. So get your act together and mise your stuff en place! Today we’re going to make a restaurant-style meal at home using our mise en place skills because it’s easy and delicious. Sometimes restaurant menus can be deceiving with their fancy descriptions and unusual fonts, but don’t be fooled. 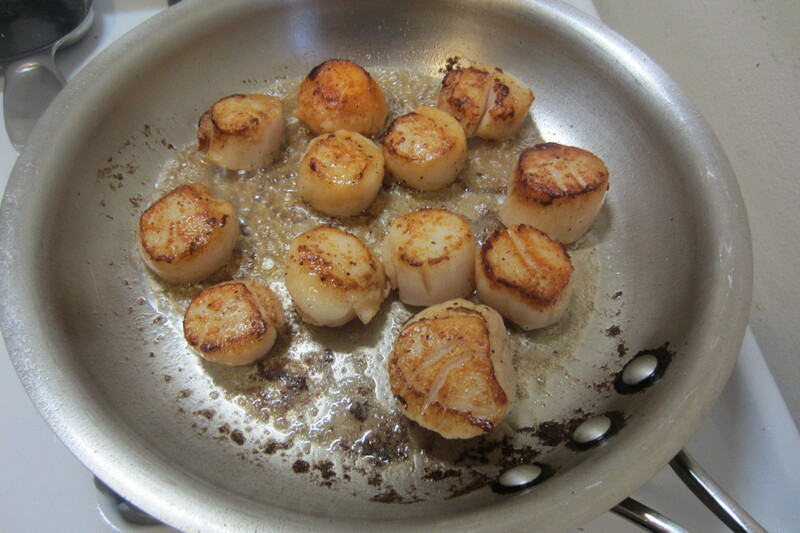 You too can pan-sear a scallop! 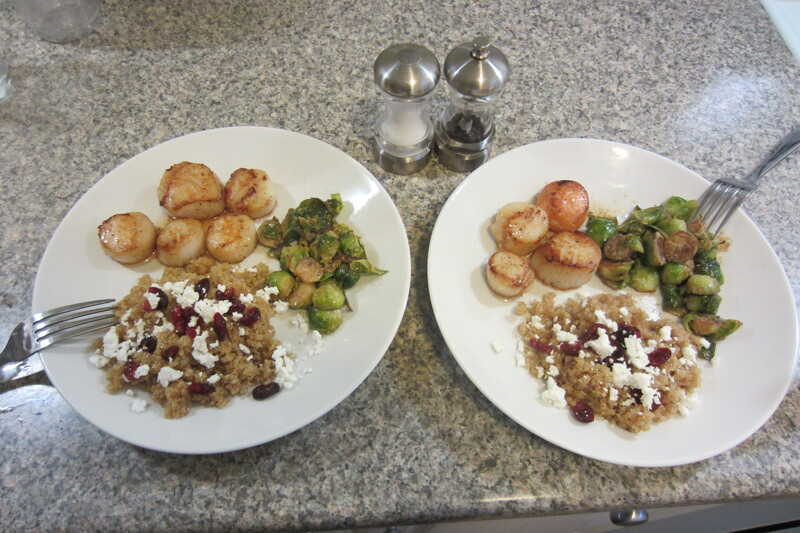 While doing our weekend grocery shopping we discovered sea scallops on sale so I insisted we get them for dinner. I love scallops and end up ordering them often at restaurants, though I find they are actually incredibly simple and quick to cook. 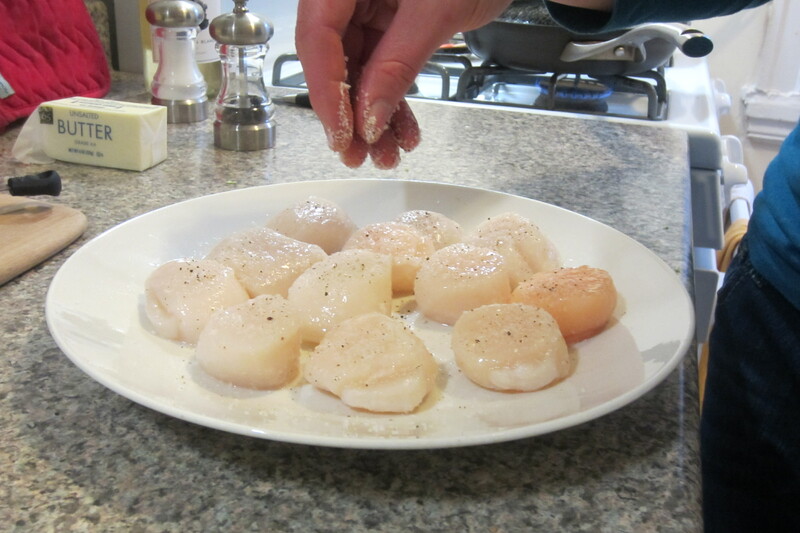 Your mise en place for these scallops is actually pretty minimal since there is no sauce. In fact you can do it while your pan is heating. The key to pan-searing anything is a hot pan. 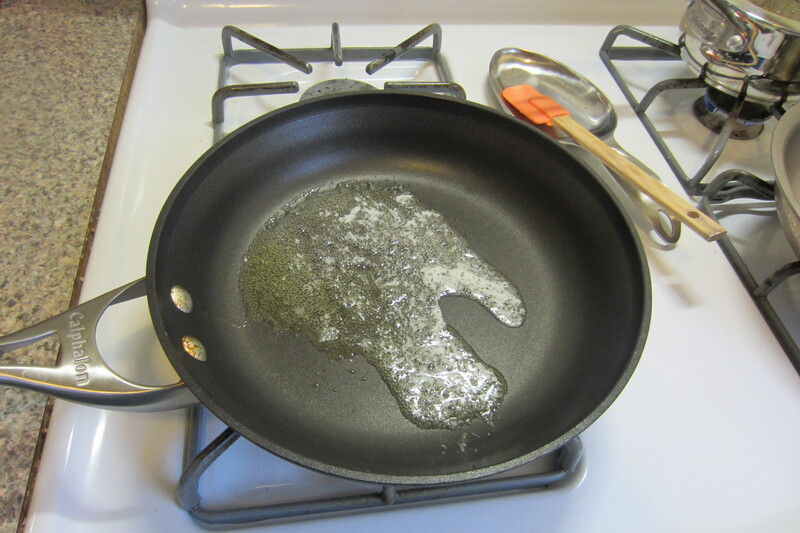 Be sure to use a good quality heavy duty skillet (not using nonstick is actually highly recommended) and heat it over medium high heat with a bit of butter (for flavor) and oil. Be careful not to let the butter burn. Depending on how hot your stove is, once you see little bits of brown (the milk solids in the butter are browning) that’s a good sign it’s getting hot. 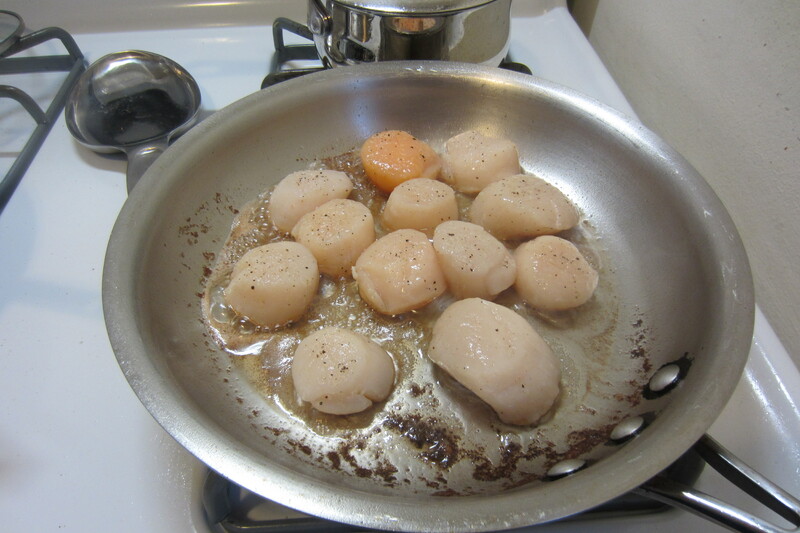 Meanwhile (mise en place) lay your scallops out on a plate, pat dry if necessary, and sprinkle with a hefty pinch of Kosher salt (I find it easier to see and better for seasoning) and a few good grinds of black pepper. 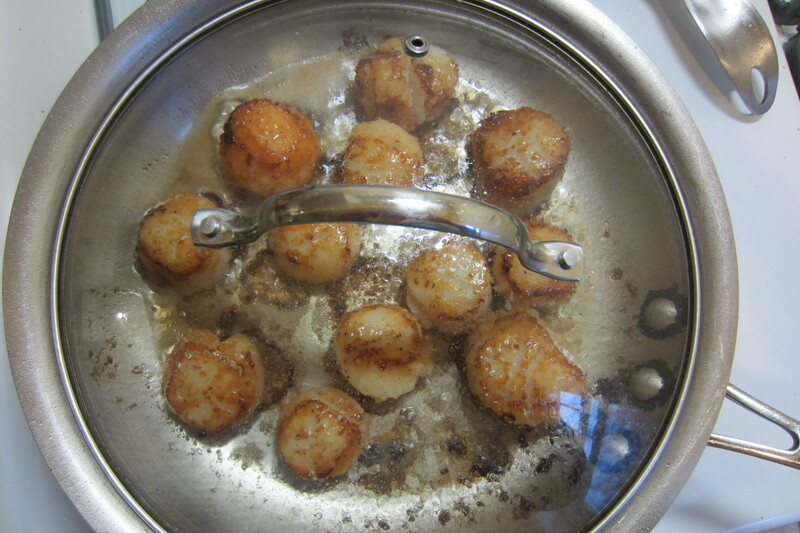 Once your pan is hot add your scallops using tongs, being sure not to overcrowd them. 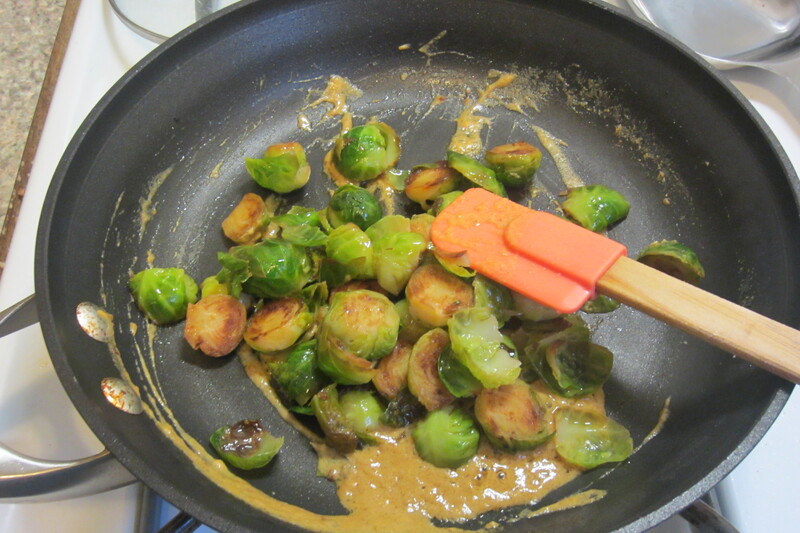 As Julia Child once said (I’m paraphrasing of course), if you want something to brown, do not crowd the pan! 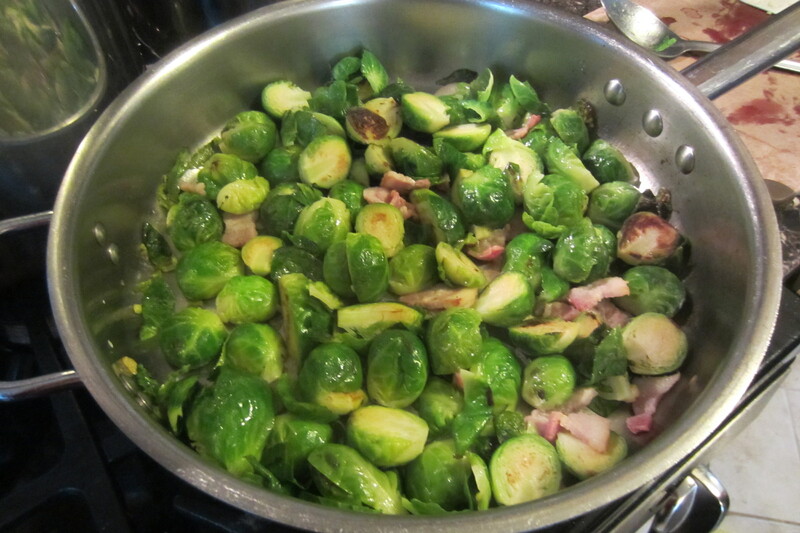 Allow them to form a nice brown crust for a few minutes and then flip to sear the other side. 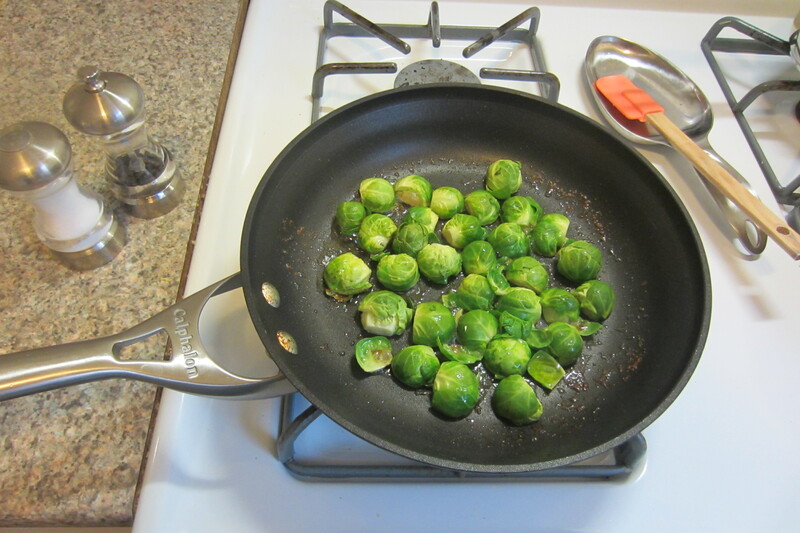 After another minute or so, turn off the heat and cover the pan with a large lid. 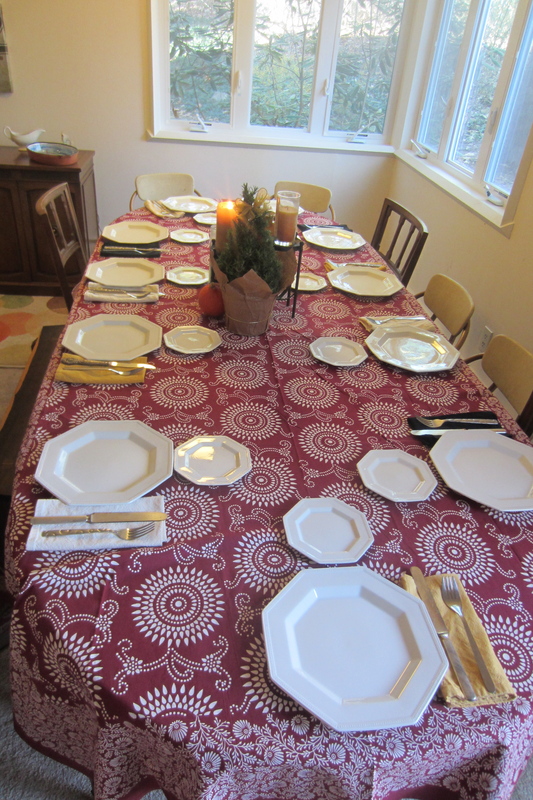 Let sit for 3-5 minutes before serving. Dinner time! And you have made a delicious meal! 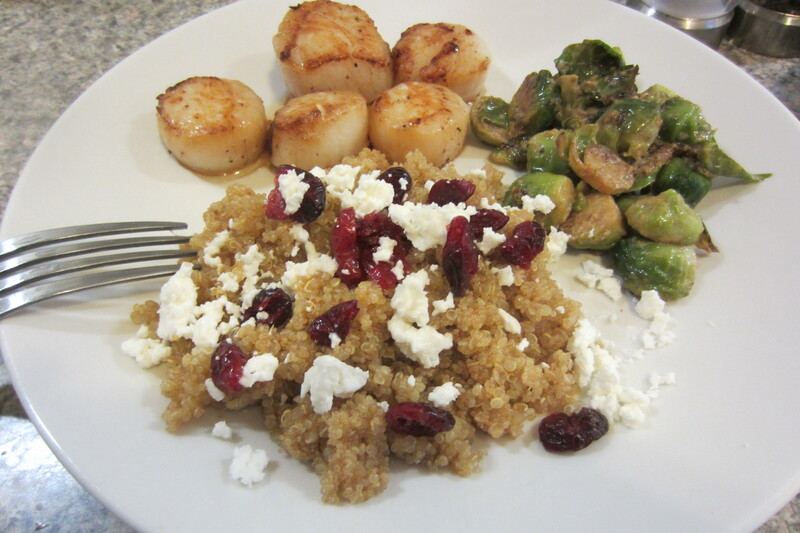 Our plates were complete with a nice pile of quinoa topped with cranberries and feta – a beautiful meal made in a short amount of time. The meal was delicious and satisfying and probably cheaper than going out to eat. In the end of course we had to do the dishes (our rule is whoever doesn’t cook does the dishes!) but the meal was well worth it. This recipe is best made with fresh scallops, as previously frozen ones will release a lot of water, therefore making it harder to sear them. I like to cook quinoa in chicken or vegetable broth to give it extra flavor. I recommend using a ratio of 1 cup quinoa to 1.5 cups water or broth (some packages recommend a lot more water, but I find it gets too mushy). As Sam always says: Bon Appetit!